When he first came up with the idea people scoffed at Don Gibson, thinking he was crazy. There was no way he’d ever be able to raise enough money to bring new soccer fields to the Cairo area to fuel the youth soccer program. The baseball and football players had Angelo Canna Town Park, but the soccer players of the Rip Van Winkle Soccer Club did not have a place they could call home — thus the soccer field project was born. 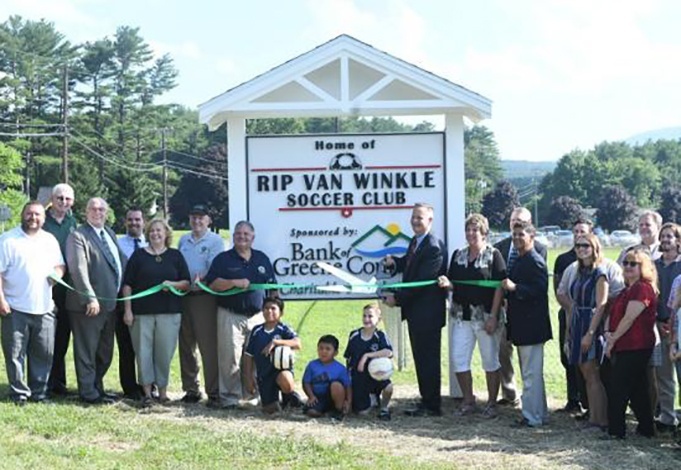 Now, 11 years later, it’s finally complete and on Thursday Gibson unveiled the fields in front of a large group, including his wife Patricia Gibson, President of the Rip Van Winkle Soccer Club, Senator George Amedore, Jr and Cairo Legislator Harry Lennon. “It’s kind of a sigh of relief — who would ever think it would take 11 years. I’m o glad it got done,” Don Gibson said. BP Contracting completed the work on the field. The company received a grant on Thursday and gave the funds back to the Soccer Club. Amedore, who was part of the ribbon cutting ceremony, was vital in getting the project complete. Without his help, there’s a possibility the project may still be in limbo. Three years ago, Gibson announced that the soccer field projected was expected to be finished by the 2016 fall soccer season, however, that never came to fruition due to funding issues. “We had raised money from charitable foundations and we hoped we were going to be able to kick it off in 2016, but when we got in estimates for the cost, the end costs were higher than we anticipated,” Gibson said. In prior years, the Rip Van Winkle Soccer Club received grants from the Hannaford Foundation, the Bank of Greene County Charitable Foundation, the Hudson River Foundation and from the Greene County Youth Pogram. With the costs increasing, Gibson and the Rip Van Winkle Soccer Club went back to the drawing board and got the help and support from Amedore. Amedore got the Soccer Club a $50,000 matching grant to help with the funding of the project. Gibson had to go through the state to get the grant and it was funded through the New York Dormitory Authority. “It was a plan that was in motion for many years. What was lacking was the resources, the money to get it all done. The helping hands in the community were abundant,” Amedore said on Thursday. “I am all for the advancement and development of youth programs. I believe in education, I believe in teaching young people the importance of teamwork as well as good physical fitness. After they received the grant from Amedore, Gibson and the Club went out to get the matching funds and received a grant from the Bank of Greene County Charitable Foundation for $50,000. The process to get to Thursday, with the ribbon cutting and unveiling of the sign, was a long and arduous one. Beyond the multiple delays, when Gibson and the Rip Van Winkle Soccer Club started the field project, they aimed toward receiving a grant from the U.S. Soccer Federation. After getting through multiple roadblocks with that process, including Greene County transferring the control of the property over the the Town of Cairo, the Club fell short of receiving a grant from the U.S. Soccer Federation because they would not have enough kids to compete as compared to the larger cities that won the grants. Gibson was frustrated with the process, however, he continued to make the dream of getting the Rip Van Winkle Soccer Club soccer fields. With the field project complete, Gibson has been reflective how much community support he has received to help accomplish the project. “It was really nice to see. It really was the whole community coming together, we had a lot of people volunteer a lot of time,” he said. The soccer field is finished, the goals will be ordered in August and now the community waits as the grass grows, which takes roughly a year. The plan is for the Rip Van Winkle Soccer Club to start playing on the fields in the 2019 fall season. With the advent of the soccer fields, Patricia and Don Gibson expect it to have an impact on the Club going forward. “It’s going to help immensely. We have teams now that are sharing spaces where we actually have to schedule practices, so it will help us to develop more teams. We have more spaces to practice and actually have games scheduled where we have more than one game going on at a time,” said Patricia Gibson. The Rip Van Winkle Soccer Club currently uses the Cairo-Durham Elementary School and Cairo-Durham High School soccer fields for practices and games and Gibson has been appreciative of the partnership the Club was able to develop with the Cairo-Durham School District in being able to use the facilities. The Club has various seasons with summer and fall leagues, along with the travel spring and fall seasons. Each season has about 130 kids in each, however, the summer season tends to be a bit larger, with just under 150 kids participating. The majority of the kids playing in the Rip Van Winkle Soccer Club play year-round. With the new field being located near Angelo Canna Town Park, Gibson’s hope is that it will bring more attention to the league with more people seeing the kids playing. She also hopes that with a home base where the Club can put up signs for registration and information, more people will contact the Club and inquire on how to get their kids involved.